I decided to try and write a series about different data access methods. Main motivation being to learn them better. The first one in the series is Active Record. I am mostly a .NET-guy these days and I really want to get to know linq better, so I will be using Linq to SQL and C#. This means that for every database table or view a class will be created. Columns of the database table will be the properties of the corresponding class. CRUD-functionality is provided by methods of the class. If there is additional business logic involved in data persisting it will be implemented internally in the active record class. 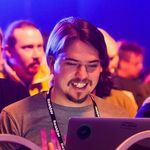 With Active Record your tables are essentially your domain objects, so it is a good data access pattern if your database has a simple enough structure. If your database structure is going to be complicated or doesn’t map well to object model you might want to consider some other strategy. We will be designing a simple todo-list application. Using SQL Server database we create a database table called “Tasks”. 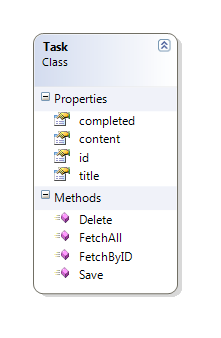 According to active record -pattern the the database columns will become properties of the corresponding class. I’ve changed the default name of the Linq to SQL -class from Task to TaskTable, because Task will be the name of the Active Record -class. Like I said earlier, each column in the table becomes a property of the class. Then we can start adding the functionality we specified. Let’s start with data retrieval. FetchAll() returns all rows in the datastore. It’s the same as FetchAll() but with added where-clause to specify a single record we want to fetch. This is severely breaking the DRY-principle, and we’ll probably want to refactor this later. The codes can be found in Bitbucket repo. As seen in this post, implementing data retrieval with active record can be quite simple. In the next part we’ll implement about create-, update- and delete -functionality and do some refactoring.